A shotgun roll is a roll of regularly circulating U.S. coins which has been tightly wrapped with tamper-evident ends by a bank or minting authority. Although the term "shotgun roll" used to refer to a roll of double length and value, nowadays the double rolls are called "double shotgun rolls" and single, normal rolls are simply "shotgun rolls." 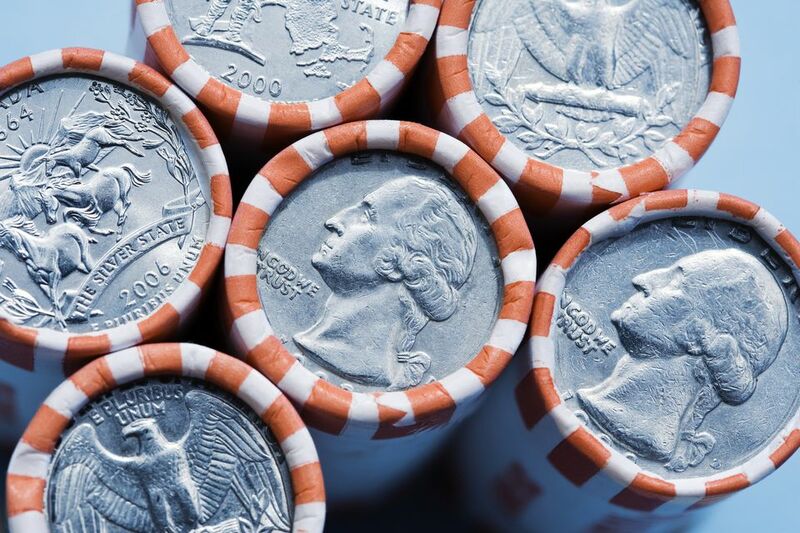 Find out how many coins are in each type of roll of U.S. coins. Are Shotgun Rolls Really Unsearched? Many coin collectors believe that shotgun rolls of coins are unsearched since the ends of the rolls are very tightly wrapped. This requires the use of a special coin rolling machine that is most commonly found at banks and minting institutions. Unfortunately, a coin rolling machine that produces these tightly wrapped coin roll ends can be purchased for under $400. It doesn't take any special mechanical knowledge or materials to run the machine. Therefore, anybody with the money to buy one can make their own shotgun rolls of coins. Some unscrupulous coin dealers will buy their own shotgun coin rolling machine in order to repackage coins that they've already searched through and removed the key date coins. In order to help sell these rolls of supposedly "unsearched" coins, they will put a bait coin at the end of the roll. A bait coin is a common coin that is specifically placed at the end of the roll facing out so the buyer can see it. For example, an average circulated 1909 VDB Lincoln wheat cent has a value of less than ten dollars. An average circulated 1909-S VDB Lincoln wheat cent has a value of almost $700. The only way to tell the difference between the two is to inspect both the obverse and the reverse of the coin. Since the dealer puts the reverse on the end of the roll only the "VDB" is showing. In order to find out if it is the rare 1909-S coin you would have to buy the roll of coins and break it open to see the obverse of the coin. Once the roll of coins is opened it cannot be returned. The same trick can be accomplished with the 1916-D Mercury dime. Other tricks that unscrupulous dealers will do in order to sell their rolls of supposedly "unsearched" coin rolls include taking brown paper (similar to paper grocery bags) and purchasing a rubberstamp with an old bank name on it. They will then stamp the paper in order to make their own vintage coin rolls. Unsuspecting people will look at these "old looking" rolls of coins and think there may be treasures inside. They may even take a wire brush and rough up the paper to make it look like the roll of coins has been around for a while. There is no definitive way to determine if a shotgun roll of coins is authentically unsearched. From my conversations with a variety of coin dealers, there is no such thing as an unsearched roll of coins.